Indulge this quick hit with full disclosure — a former student of mine, already a talented filmmaker when I knew her, has created a short science fiction film that has gotten a lot of attention at Cinequest. 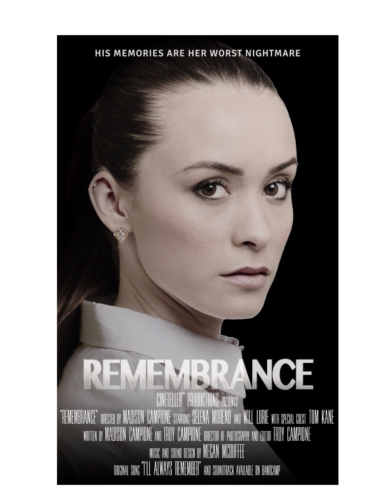 “Remembrance” has earned 19-year old director and co-writer Madison Campione an internship at Cannes this summer, where she will work either at a production company or television studio. Watching her short, it’s not hard to see why she’s getting the attention. Dealing with identical twins, a murder mystery, and an experimental technology to “read” memories, it’s a fast-paced little film with the potential to be expanded. Scenes alternate between straight-forward and borderline hallucinatory as Campione plays with the sequence of events. Her father Troy serves as cinematographer, giving everything a silvery patina that makes lead actress Selena Moreno look like a classic movie star, though her attitude is completely modern. Playing as part of the “College Short” program at Cinequest, “Remembrance” is an impressive debut, and a reminder that in the Cinequest shorts, you’ll find little gems today that can lead to classics tomorrow.